Washington, DC– Earth's magnetic field shields us from deadly cosmic radiation, and without it, life as we know it could not exist here. The motion of liquid iron in the planet's outer core, a phenomenon called a "geodynamo," generates the field. But how it was first created and then sustained throughout Earth's history has remained a mystery to scientists. New work published in Nature from a team led by Carnegie's Alexander Goncharov sheds light on the history of this incredibly important geologic occurrence. A better understanding of how heat is conducted by the solid of the inner core and the liquid in the outer core is needed to piece together the processes by which our planet, and our magnetic field, evolved–and, even more importantly, the energy that sustains a continuous magnetic field. But these materials obviously exist under very extreme conditions, both very high temperatures and very intense pressures. This means that their behavior isn't going to be the same as it is on the surface. "We sensed a pressing need for direct thermal conductivity measurements of core materials under conditions relevant to the core," Goncharov said. "Because, of course, it is impossible for us to reach anywhere close to Earth's core and take samples for ourselves." 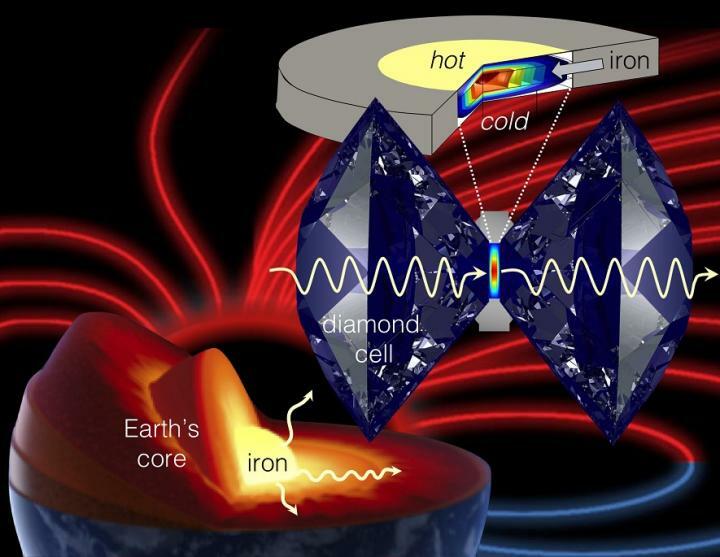 They found that the ability of these iron samples to transmit heat matched with the lower end of previous estimates of thermal conductivity in Earth's core–between 18 and 44 watts per meter per kelvin, in the units scientists use to measure such things. This translates to predictions that the energy necessary to sustain the geodynamo has been available since very early in the history of Earth. "In order to better understand core heat conductivity, we will next need to tackle how the non-iron materials that went along for the ride when iron sunk to the core affect these thermal processes inside of our planet," Goncharov added. The paper's other authors are Zuzana Konopkova of DESY Photon Science, Stewart McWilliams of University of Edinburgh, and Natalia Gomez-Perez of Universidad de Los Andes.